I received a pair of Schmoolz a few weeks ago to tryout by the inventor in the UK. I’ve since spent a few trips to the gyms around Zurich with these interesting ice or dry tools for indoor climbing, getting a feeling for how they work and how useful they are. If you want to know the answer before getting to the end of this article, I’ll just tell you, I think they rock. Ice climbing is really a special sport. With normal rock climbing it’s already enough of a hassle finding a partner. They need to be reliable, push you when needed and understand your limits. Plus they need shoes and a rope. 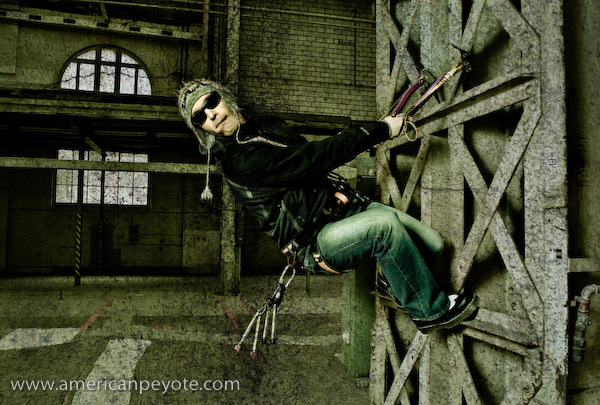 With ice climbing and dry tooling you now need a partner one step up on the “alternative” sport ladder. You need one which has money to accessorize with ice axes, decent crampons, ice screws, the equipment list starts to explode a bit. And you need to find a climber who likes the idea of climbing sheets of ice. Then factor in the fact that you can’t generally climb all the time. Routes have to be in the right conditions, at the right time of year. Ahhh, but when you’re out on the ice, the details dissolve. But what do you do when you want to train, to go to the gym? Climbing gyms are generally not the place for ice tools. Steel picks destroy resin holds and the crowded nature of many gyms makes it dangerous to be tooling around with a pair of axes in your hands. There is actually a dry tooling bouldering area at Kirche Fluntern in Zurich (part of ASVZ, the university sport division). 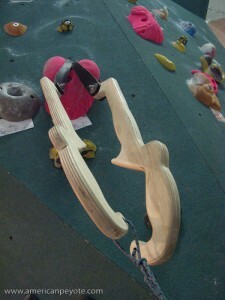 Basically they took a bouldering area and replaced the resin holds with little blocks of wood. It’s a sweet place to train, but I don’t live around there anymore. There have been some attempts to develop ice climbing indoors. Grivel offered an indoor pick at one point (if I remember correctly). However, unless you build your own bouldering area or set wood blocks in the wall of your basement, there are few ways to train for ice climbing in they gym. In Colorado for example, some gyms have fake ice, but it’s a rare gym you can find this stuff in and they generally won’t let you lead climb. The Schmoolz is an answer to the question of indoor ice climbing training. The Schmoolz design is very simple, place an industrial strength rubber loop on the end of a well-designed wooden shaft, which is cut in the contoured form of an ice tool. 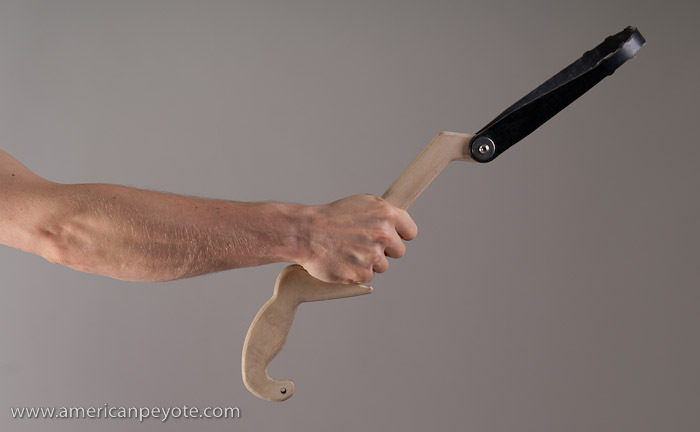 The contours of the shaft are perfect to grip and hang on, while the rubber loop hangs on climbing holds in the gym. 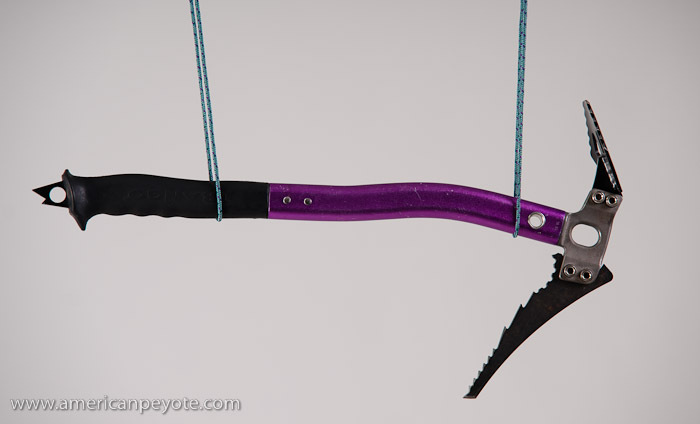 Now you have the feel of an ice tool in the training environment of a traditional climbing gym. You can train your ice technique when you like and don’t have to worry about the ice conditions outside. This mean you can maintain and develop your technique throught the year. The concept is simple, the rubber loop is similar to a climbing shoe, which means you generate a lot of friction when placing the loop on a gym climbing hold. As you pull down, tension is created in the loop and it conforms to the surface of the hold, and you climb up like normal. When placed correctly the Schmoolz are very secure. 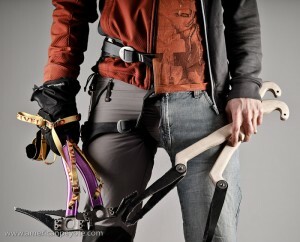 The design is an excellent adaptation of the ice tool experience to the climbing gym environment. Now, as you might imagine, not all holds work with the Schmoolz. The best are small knobs that are usually meant to be foot holds. The loop grips very well over these knobs and the placement is totally secure. The most problematic holds are those which are larger and slopping downwards, it’s sometimes impossible to get a secure placement and you run the risk of falling off. 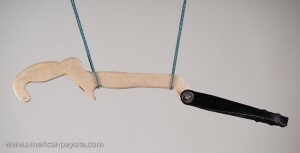 One alternative is to turn the Schmoolz upside down and use the contour to hook on to small features of holds. For this reason, it takes some time to choose a route to climb with the Schmoolz, and you’ll probably need to climb on holds from two or three routes when sending a line. Is the Schmoolz experience like dry tooling in a parking garage? Well, no, just like climbing in a gym is no substitute for navigating alpine sport climbs in the Swiss Alps. You use different techniques for ice, dry, gym, sport, and trad climbing. The point of training is to develop your mind and body to meet the challenge of whatever route you decide to climb. The thing I love about using the Schmoolz is that it’s really another subset of the vertical experience. I don’t know if that was the intention of the inventors, but the thing about technology is that you never know exactly what people will do with the thing you give them to play with. The way I climb with the Schmoolz is possibly not exactly the way I would dry tool up a similar route. But I don’t see that as being a problem. I love that it’s a combination of ice and rock climbing. You have the free feeling of using leash-less tools and also the dancing form inherent in climbing. I see routes in different ways with the Schmoolz, and that new challenge is the thing I love about climbing with them. I often hear people describe rock climbing as a puzzle, a delicate balance between toeing a rock edge and falling into a void. The same person might describe ice climbing as a masterful battle with the frozen world, the assumption being that you have to hack the hell out of an ice sheet to climb it. I think this latter stereotype is complete BS. I enjoy ice climbing much more when I use movements developed from sport climbing, rather than imagining myself as some new-age superhero wearing black tights and sporting two axes fashioned after the claw of a Raptor skeleton. Obviously, with the Schmoolz you can’t develop your swinging arm strength as would be used in waterfall ice climbing to get tool placements. 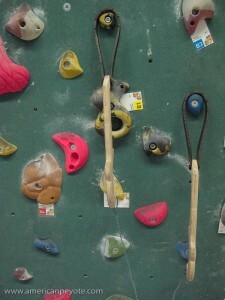 Instead you focus on the placement of the tool more as you would be dry tooling. I think a lot of emphasis is always placed on the arm strength required for ice climbing, but if you do it with finesse and focus on secure tool placements, you end up using less energy, and that’s a very important technique which is pushed when climbing with the Schmoolz. Since you can’t swing like an ice maniac indoors, the Schmoolz forces you to climb elegantly with ice tools. I think that is the best reason to buy a pair. It develops your ability to rethink routes and plan your tool placements instead of just swinging into an ice wall. When you rethink your routes on the wall an easy 4a might turn into the equivalent of a delicate 5b using the Schmoolz. Unless your gym is rearranging the routes once a week (I don’t know any which do) it’s easy to get lazy in a comfortable gym while always doing the same climbs. But with the Schmoolz, you’re challenged to rethink the routes, as well as climbing using tools instead of fingers. Naturally you balance differently with ice tools than when you’re rock climbing, and this technique is developed with the Schmoolz. This just adds a lot more to a climbing evening. My favorite thing at the moment is to climb normally for 3/4 of the night, and then boulder with the Schmoolz after my finger strength is gone from attempting 6b routes. In this way I’m able train my legs and balancing skills even after I’m too tired to climb with my fingers, and I’m forced rethink easy routes – and to find new ones on familiar walls. All in all it’s a fun way to climb. The Schmoolz adds another dimension, they challenge me, and additionally I get a lot of looks from all the other climbers in the hall. If you’re looking for a way to train to ice or dry tooling in the gym environment and are tired of trying to get your tool fill on wood blocks and buildings, I recommend checking out the Schmoolz.